Marin, Switzerland, 7 November 2016 – EM Microelectronic, the semiconductor company of the Swatch Group, announces the EM9304, a tiny, low-power, system-on-chip (SoC) optimized for Bluetooth® v4.2 low energy enabled IoT, wearable and smart electronics products. The EM9304 is architected for flexible usage in a variety of Bluetooth low energy (BLE) applications. 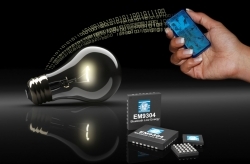 For simple applications such as beacons or smart sensing wearables, the EM9304 can be used standalone, or connected to a variety of sensors with standard serial interfaces. Users can also take advantage of a powerful yet low-power 32-bit processor with a floating-point-unit (FPU) and on-chip NVM. Alternatively, the EM9304 can be connected with a standard MCU or custom ASIC for customers requiring a just a simple and easy-to-implement BLE add-on function to existing applications. The EM9304 is the smallest BLE v4.2 SoC available on the market and features a best-in-class 2.4GHz transceiver with state-of-the art receiver sensitivity, and programmable transmit power for optimized current consumption. The EM9304 includes a sophisticated on-chip power management system with automatic configuration for 1.5V or 3V batteries. It is compatible with standard 1.5V MCU’s such as ultra-low-power watch microprocessors from EM Microelectronic, or with standard 3V microprocessors from many vendors. The EM9304 comes with 128kB OTP for applications, 48kB RAM to support application development, and up to 20kB RAM of retention data RAM. “EM has been at the forefront of integrated BLE solutions for many years, with the well-established EM9301 BLE controller and the EMBC0x beacons which were among the first on the market” says Michel Willemin, CEO of EM Microelectronic Marin. He adds, “The EM9304 adds flexibility and outstanding performance in a tiny chip, thereby reinforcing EM’s portfolio of low-power integrated solutions like the EM850x Energy Harvesting chips and the sensor fusion co-processing ICs which are paving the way to concrete IoT applications”. Included in ROM is a certified Bluetooth v4.2 stack with proprietary Application Controller Interface (ACI) and Link layer with a Host Controller Interface (HCI). It supports secure connections, extended packet length, and multiple connections. Current consumption is minimized for all modes of the application utilizing an efficient scheduler and memory manager. Furthermore, the EM9304 comes with firmware over-the-air (FOTA) updating routines that can run per application, function, or configuration to minimize download time. Hardware and software development kits are available now, including commercially available tools with an IDE and debugger. A website and forum are available to help customers with their development – and includes hardware and firmware examples. QFN samples are available now and full production will be early 2017. Customer support for PCB design, and FCC/CE certification are available.